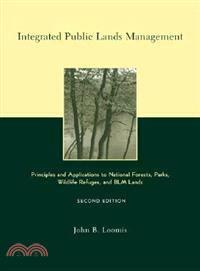 "Integrated Public Lands Management" is the only book that deals with the management procedures of all the primary public land management agencies -- National Forests, Parks, Wildlife Refuges, and the Bureau of Land Management -- in one volume. This book fills the need for a unified treatment of the analytical procedures used by federal land management agencies in planning and managing their diverse lands. The second edition charts the progress these agencies have made toward the management of their lands as ecosystems. It includes new U.S. Forest Service regulations, expanded coverage of Geographic Information Systems, and new legislation on the U.S. Fish and Wildlife Service and National Wildlife Refuges. John Loomis is professor of agriculture and resource economics at Colorado State University. He has previously worked at the U.S. Fish and Wildlife Service and the Bureau of Land Management.